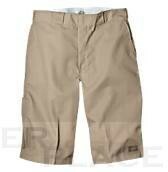 Dickies Traditional in style Workpant briefly in beige. The pocket arrangement provides for a great casual style. We are happy to advise you personally on the phone or via email.